Some eight hundred young people hailing from various schools, churches, parishes and organizations of different cities, provinces and islands, actively took part in the magnificent Run4unity event organized and animated by the young ones and the youth of the Focolare Movement in Central and South Philippines. The entire day of 12 May 2012 was dedicated in Cebu City while May 10 was slated for Davao City. These were indeed splendid days filled with much enthusiasm, joy and vigor! It was such a visible fruit of the unity built together by the Teens for Unity, Youth for a United World and the adults in the movement. The project “Coloring our Cities with Love” was openly launched as a challenge to be lived together and was presented through creative dances and choreography, songs, personal and collective experiences of the gen, workshops and games. As Chiara Lubich have said that we need to do our calculations in coloring our city, plans of concrete actions were drawn up in the workshop with the help of the mathematical signs in response to the challenges thrown by the gen: the six (6) yeses. Everyone is already looking forward to concretize their plans together with us. Concretely, we put in common our talents and skills and guess what?… we were able to create a band! The songs played, all animated with dance steps transmitted to everyone the joy of living in unity and the revolution of love that we want to bring ahead with them! The choreography on how to color the city with love and the different experiences shared by us thru the mathematical signs gave the participants much enthusiasm in cooperating during the workshop and giving their “Yeses” to Responsibility, Solidarity, Creation, Just Economy, Life and to Family and Peace. Each group chose a specific ‘Yes’ and made a project proposal on how to concretize it in their respective parishes, schools, churches and other organizations. And they also invited us to join in their project because they wanted us to continue the rapport with them. In the afternoon, we had an “Amazing Race”. We were the group leaders while the Gen2 were the Station masters. It was a challenging moment because we thought that handling a big group was difficult. Yet, we easily built unity because each one tried to love. We have seen the joy of each participant who really enjoyed these games of unity. We took the run with much fun waving our colorful scarf. To our surprise, a TV network station, ABS-CBN, came over and made coverage of this wonderful event. And some of us were interviewed on who we are, on what is our goal and on how to achieve unity among us. It was really a great opportunity for us to share the ideal from the “skyscrapers”(from the rooftops so to say). Our interesting finale was the Flash Mob of our YES to all the goals and proposals of the Run4Unity. Gerome:It was the best Run4Unity ever! I’m so happy with this event because I was able to build Jesus in the Midst, loving concretely together with the gen3 and gen2. Lyka: For me, the run4unity was first of all an experience among us. It was the first time to make an activity together with the gen3 boys. I felt that since each of us tried to love, it was really a race to unity and we felt that Jesus in the Midst among us grew more and more that on the day of the RUN4UNITY, our unity was felt and touched by many teens and youth during the event. Alyssa: Run4unity is really a challenge! During the preparations and the practice, there were many difficulties to overcome, but since we realized that it was the will of God for us, I felt a special grace to go beyond and love more. In our group during the amazing race…it was also a race to love since it was a big group of 50, but at the end…many of them felt the real joy that cannot be explained: they didn’t know that it was the big Jesus in the Midst among us that conquered all. Pierro: For me, the run4unity was a witness of our unity that Chiara taught us! We continue to love one another and spread the fire of love we live. 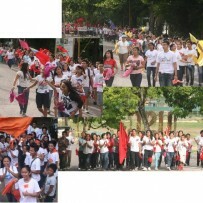 Honey: Real Joy and unity during the Run4Unity was generated through our love for Jesus Forsaken. And I experienced that if we are only nothing, the Holy Spirit can enter and work in us! During the selection of the venue for the Run4unity, I felt strongly that I didn’t give my all. Much later, I realized that I was very uncomfortable with what was decided and I just couldn’t sleep. So when I told this to my gen assistant we immediately propose an urgent meeting with the arcogen boys. We are very struck of the confidence given to us by the gen assistants allowing us to decide among ourselves (gen boys and gen girls). The pact that we made before we started, asking for the presence of the Holy Spirit made our meeting super! We couldn’t contain the joy that invaded our hearts! Then, when we shared this to our gen assistants they too were very happy. God is really great…for everything that we have planned together became a reality and providence was overflowing!!! Ciao to everyone especially to all the Teens for Unity over the world! We thank Jesus in the Midst for this wonderful experience! We are sure that Chiara Lubich from heaven was smiling at us and telling us to go ahead together with you living the Word of Life in every present moment! I really had fun in this event. I met a lot of new friends and most especially, united with the other people especially with the other Gen. For me, this is the best Run4Unity so far that I have experienced in Cebu. Run4unity2012 was a video clip, an exposition of strong unity among the gen! Jesus in the Midst was so strong and visible that many teens and youth who participated this extraordinary event expressed their great joy saying that this event is really special and they felt something that they couldn’t explain (and the gen said: it was the presence of God among us!) With their yeses expressed in a THUMBS UP SIGN (like) they asked the gen to continue this run4unity in their parishes, schools, organizations working together concretely the 6 yeses COLORING OUR CITY WITH LOVE!!!! Go go go go!!! !